UK Government has outlined plans that could lead to parking spaces being removed from city centres, vans disappearing from towns and cities and even the potential use of flying cars to revolutionise transport using technology. The government’s Last Mile and Future of mobility call for evidence documents were published today and refer to use of up and coming technology to transform transport in various fields. The documents are being used to kickstart the Future of Mobiity Grand Challenge, which aims to make the UK a world leader in the movement of goods, services and people. Additionally, the goal is to concurrently reduce greenhouse gas emissions, make travel safer, improve accessibility and present economic opportunities for the UK. Electric cargo bikes, vans, quadricycles and micro vehicles are proposed as possible alternatives for last-mile delivery in UK towns and cities, replacing the four million vans currently on the road and offering the potential to vastly reduce emissions and congestion. 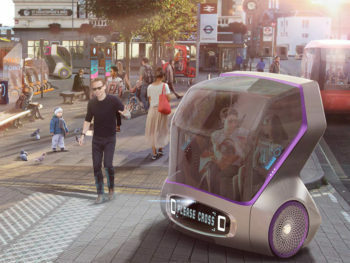 The government believes the following trends could shape the future of transport in the UK: cleaner transport, automation, data and connectivity, new modes, shared mobility, changing consumer attitudes, new business models (including Mobility as a Service). These are touted to offer the potential to remove parking spaces from city centres, with the vehicles being able to free up spaces by driving out of town once they’ve delivered passengers to their destinations. The government proposes that the freed up space could assist with the apparent housing shortage, creating “hundreds of thousands of new urban homes”. A £12.1m funding pot has been confirmed, for six projects working on simulation and modelling to aid the development of connected and autonomous vehicles. The government isn’t shying away from future technology that it says could dramatically change transport as we know it today, with, for example, the introduction of flying vehicles. The government is exploring at how it could remove regulatory barriers to technological and service innovation and to help better understand how data can be better used to improve transport. Ian Robertson, former board member at BMW, has been appointed as business champion to help advise, shape and develop the Future of Mobility Grand Challenge. He will be supported by an Advisory Council made up of Isobel Dedring, Tracy Westall and Stan Boland.